In July 2018 NPNA and a broad coalition launched the Campaign to Tear Down the Second Wall. The Campaign aims to tear down the “second wall” of more than 750,000 citizenship applications currently backlogged by U.S. Citizenship and Immigration Services (USCIS) and compel the agency to reduce the processing time for citizenship applications to six months or less (the processing time currently exceeds 20 months in certain parts of the country). The Campaign also aims to increase transparency within USCIS and publicly encourage and directly support lawful permanent residents to Naturalize NOW, despite hurdles, looking forward to 2020. We are currently fighting for these objectives by educating and supporting our communities to naturalize; enlisting Congressional and Mayors’ support for tearing down the second wall; scrutinizing the continuing backlog, and litigating, based on our Freedom of Information Act request, to determine what is causing the unacceptable delays in immigrants’ ability to become citizens and voters. Read and watch more about the Campaign to Tear Down the Second Wall in the Los Angeles Times, NBC, NPR, Telemundo, and Washington Post. 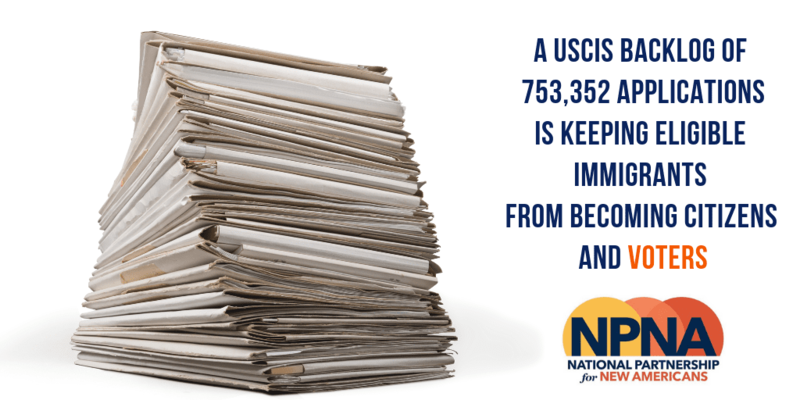 **Updated with newest USCIS data (March 2019).